AMES, Iowa – Jobs continue to be a driving factor of population growth and shifts in Iowa, which explains the ongoing decline in many small towns. An analysis of U.S. Census Bureau data found more than 60 percent of cities lost population since 2010. Liesl Eathington, an assistant scientist for the Iowa Community Indicators Program at Iowa State University, says this is a continuation of past trends. Much of the growth – around 52 percent – occurred in cities with populations between 10,000 to 49,999 residents. Cities with fewer than 500 residents were hit the hardest, losing 3 percent of their combined population. Iowa’s 10 largest cities accounted for 44 percent of statewide growth from 2010 to 2013. However, three of those cities (Waterloo, Sioux City and Council Bluffs) experienced a loss. Not surprisingly, location is vital for growth. Eathington says close proximity to a metropolitan area was the primary reason for population increases in smaller cities. For example, the town of Tiffin, about 10 miles west of Iowa City, grew by 20.5 percent. Similar communities with populations of 500 to 2,499 remained unchanged during the three-year time frame. And Albion, about 10 miles north of Marshalltown, lost nearly 7 percent of its population. Overall, Iowa is growing at slower rate than the U.S. – a long-term pattern that Eathington has tracked along with the shift to larger cities. Reversing this trend seems unrealistic. Eathington is often asked what can be done, but she says the best suggestion may be to temper expectations. Eathington does point out that the analysis is just a snapshot and still early in the decade. 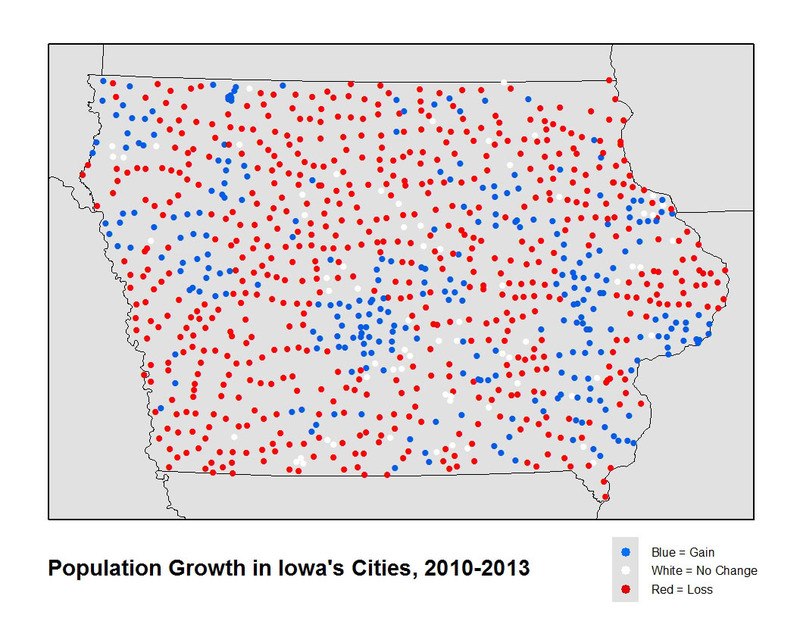 However, the results are consistent with past population trends in Iowa. The population estimates from the U.S. Census Bureau include all residents regardless of immigration status. Click here to read the full report. An analysis of U.S. Census Bureau data found more than 60 percent of Iowa cities lost population since 2010. Much of the growth – around 52 percent – occurred in cities with populations between 10,000 to 49,999 residents. Cities with fewer than 500 residents were hit the hardest, losing 3 percent of their combined population.